For most homeowners in Ohio, your home represents the largest purchase you will ever make. There is a great deal of pride in having a great looking home that has lots of curb appeal. That is why Central Power Wash only uses the latest techniques coupled with the finest quality products and supplies available to protect and clean your investment. Homes throughout all of Ohio endure some of Mother Nature’s most extreme weather conditions. From wintry blizzards that leave snow drifts piled up to your gutters, spring thunderstorms that drench your home in mud, to the sizzling 90+ degree heat of summer, your home takes a beating. No matter what type of siding you have on your home, after a couple seasons your home may start to look, well…dirty! Dirt and moisture always find ways to cling to your home allowing mold and mildew to grow and spread. Your once vibrant red brick or brilliant paint job may become dull or faded. What to do? While you should NEVER let anyone use high pressure on your home (extreme damage will occur!) there is a solution, it’s our soft wash house washing process. Soft Wash uses very low pressure to apply environmentally friendly cleaning solutions to your home which remove mold, mildew, algae, moss and other contaminants. It’s a completely safe and inexpensive way to restore the curb appeal of your home. Combine this service with our window cleaning to truly make your home the envy of the neighborhood! Sidewalks, driveways, walkways and concrete patios can make up a large portion of the area on your property so when their appearance starts to dull and fade it has a major impact on the way your home looks. It’s no wonder then that having the concrete areas around your home pressure washed is one of the easiest ways to dramatically improve the overall curb appeal of your home. But did you know there is another reason that you should have your concrete pressure washed regularly? See those black stains in your concrete? More than likely that’s not dirt! The majority of stains on concrete are not stains at all but rather fungus, mold and mildew that you track into your home every time you walk on it! These spores that enter your home can pose a health risk to your family. 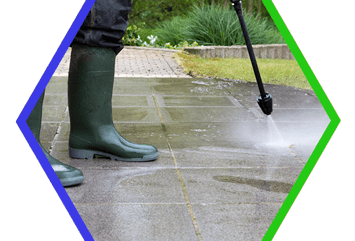 A regular program of concrete pressure washing will not only keep your concrete looking like new, it will also eliminate any contaminants that may exist.